Use segmentation to filter your subscriber list based on characteristics or behaviors of your recipients. You can take a list of 800,000 recipients, for example, and create a segment that targets just 50,000 of them based on criteria such as past purchases or age bracket. Segmentation should be an easy feature to use, but many ESPs make it more complicated than it ought to be by creating separate lists for each segment and duplicating email entries unnecessarily. If you’ve ever received email from a sender that you know you unsubscribed from, poor segmentation implementation might be the culprit. You’ll never have this problem with Symphonie. Since all unsubscribes are referred back to the master list, you don’t have to worry about having your mailings marked as spam or reported for CAN-SPAM violations. Symphonie has always made it easy to create segments, and now we’ve improved the process even further by letting you create segments directly within the mailing creation process. You can still create reusable segments, but now you can also create one-time segments for special mailings. Our integrated graphical wizard lets you pick the criteria you want to use for targeting. 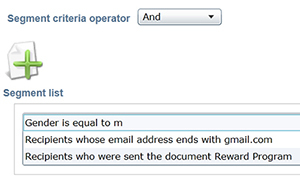 Use a single criterion, or pick multiple criteria and utilize the relationships between them. Time based criteria, such as five days before a recipient's birthday or three days before the recipient's subscription anniversary. Clicks on links, or failures to click. For example, target those that clicked a link for information about upcoming webinars. Page views from your website. For example, target those that view pages about cameras. And much more! Symphonie’s segmentation options are extremely powerful. Contact us if you want to see for yourself the rich options supported in segmentation. Even after segmentation, you can apply split testing to ensure higher open rates on your mailings. Use segmentation in conjunction with dynamic content to create a highly-individualized level of personalization. Using segmentation in conjunction with automation can streamline your processes and lessen your workload.